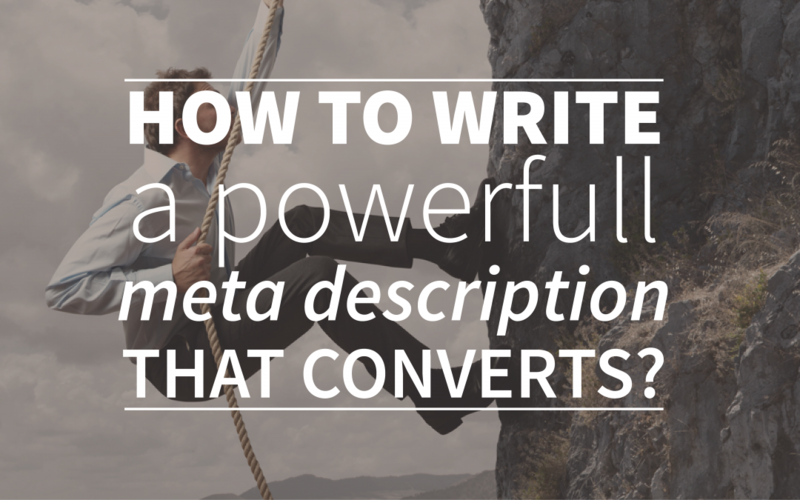 How To Write A Powerful Meta Description That Converts? One of the essential elements of SEO is the meta description. This small text of only 156 characters can lead to success or failure in the search engines. Even if your meta description is technically optimized, it’s still possible that it doesn’t convert your views in the search engines to actual traffic and leads on your website. That’s exactly why you should pay much attention to this element! Many people find it hard to write a powerful and clickable meta description and we’ve got to be honest, it isn’t that easy. How do you make sure that your meta description gets more attention than the ones of your competitors? Do you need to give a full summary in your description, or should you leave the content to their imagination? We’ve gathered the 6 most useful tips while writing your meta description, that will help you to get sky-high conversion rates! Wait, what’s a meta description? For those of you that have no idea what we’re talking about; the meta description is the small piece of information in Google, right under your title tag in black, just like you can see in the picture below. In most of the CMS’s you’ll be able to fill in your meta description right away. If you write your content in html, you should add the meta description to your head, like we did in the example below. The purpose of this piece of information is to give searchers an impression of what the page is about. This way it should be easy for them to determine whether the page is valuable for them or not. Your page title, combined with the meta description is the book cover of your website, so you should make sure that you use this opportunity to present yourself! So, how to improve your meta description? If you don’t write your own meta description, Google will generate it automatically and you’ll end up with 188 characters of loose information, the first thing that Google could find on your page, with no value at all. Maybe you’re lucky, if you’ve written a perfect summary in the first sentence of your page, but most of the times this info isn’t that attractive. That’s why you should always write your own meta description, leave nothing to chance and determine your own appearance! The ideal lenght of a meta description is about 155-160 characters. Even though you can add up to 188 character, serveral studies show that meta descriptions with no more than 160 charactes get the best results. It’s very important that your meta description is relevant to your content. If you mislead the searchers with loose promises or other misinformation than your bounce rate will raise drasticly, which means lower search engine rankings! The best way to generate relevant traffic through your meta description is to summarize your content in an attractive way. If you want to optimize your meta description technically, you should add your keyword at least once. This shouldn’t be that hard if you’ve chosen the right keyword, because your keyword mostly summarizes your article. Make sure that people can see that your website is credible, this generates trust in and will help you to increase your traffic. For example, the Dutch beer brewery Grolsch has increased their crediblity by adding; ‘since 1615’ to their meta description. Also sentences like; ‘approved by 1000 webshop owners’ can lead to more credibility, as simple as that! Crediblity = clickablity! People like to know what they’re dealing with, so use words with value and let them know exactly what you have to offer. Give them a reason to click through and to read your content. Highlight your special offer, tips that they MUST read, guide that will help you to become a professional or whatever they could possibly want by clicking your link. But watch out, don’t make it too commercial, this could scare the searchers off. Think about what they’re looking for if they find link to your website! If you follow these tips, you’ll be able to write a pretty good meta description. But like we said before, a good meta description is nothing without a good page title. That’s why we would recommend you to read our other article, about high converting page titles. If you’ve found the perfect combination, we’re sure that your website will have a great ‘book cover’ in the Google librairy! Then the only thing you need is our free webtexttool trial to rank higher and let the games begin. Good luck!